In this week’s episode, we continue on with part 2 of “The Coach’s Spotlight Series”. This week’s featured coach, is Brad Loomis. What are his athletic goals for the next few years? Is he starting to develop an itch to get back on the bodybuilding stage? What are his very unique methods, when it comes to handling his training, and meal-timing frequency? After finishing up with Brad “The Athlete”, Andrea and Brad begin to touch on Brad “The Coach” and Brad “The Father”. What are some of his major coaching highlights from this past year? What kind of book is he currently working on? How have his priorities, and his outlook on life, shifted this year, compared to years prior? 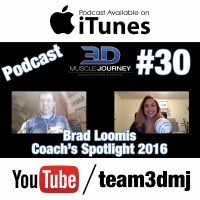 Sit back, and relax with your favorite protein powder, and enjoy this week’s episode on the life and mindset of coach Brad Loomis.